L.A. School Board President Mónica García. 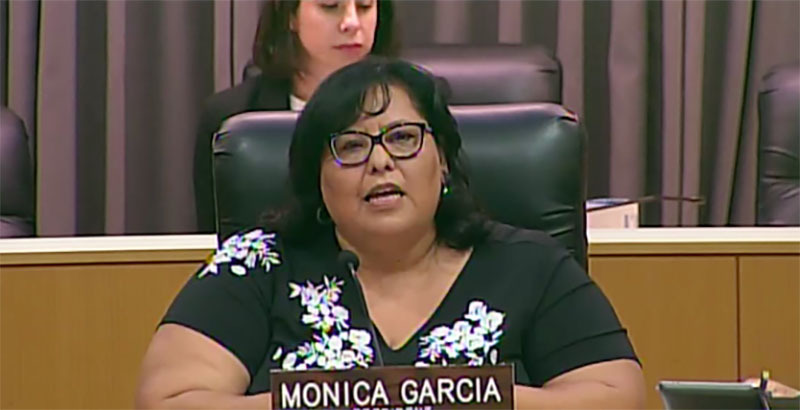 At Tuesday’s annual meeting of the LA Unified school board, Mónica García was elected to another term as president, and a proposed parcel tax that would have generated $500 million a year for the cash-strapped district failed to garner enough support to make the November ballot. Although he didn’t cast a vote, Superintendent Austin Beutner said he preferred to hold off on the measure until 2020, when the district’s own polling showed it stands a better chance of passing. Polling results showed lukewarm support for a November vote on the measure, which the district would have had to pay roughly $6 million to support — money that would be lost to the district if the measure wasn’t successful. LA Unified faces a budget deficit of $482 million by 2020, a shortfall the parcel tax was intended to fill. Some estimates show that within 13 years health care and pension obligations will eat up over 50 percent of the district’s budget.